Terror Tuesday is ONE YEAR OLD! It is officially one year (well Tuesday to Tuesday) since Terror Tuesday emerged from the primordial ooze that is my brain. Fifty three (52 weeks plus a Halloween special) later Terror Tuesday is going from strength to strength. Over the past year I’ve moved countries three times, graduated and started two new jobs and I am very pleased that I have managed to never miss a week in all that time! There were a couple of weeks (such as when I didn’t have the internet at my new flat) that I thought I wouldn’t make it but with the help of my wonderful guest reviewer, Jenny Mugridge (www.jennymugridge.com) it hasn’t failed! There is no new review this week but a low-down of my favourite films from each decade. 1920s – Häxan: Witchcraft through the ages (1922) This film is unique in the films I’ve reviewed so far in that it is a documentary rather than fiction. Häxan is split into seven chapters and recounts the history of witchcraft from ancient times through to the 1920s. The film consists of conventional documentary chapters complete with voiceover and pointy stick and short fictionalised stories. 1930s – White Zombie (1932) Starring Bela Lugosi as a voodoo master on a Caribbean island who has the ability to enslave people to his will creating an army of zombies. Lugosi’s talent is used by Beaumont, a wealthy plantation owner for nefarious reasons. One of the stars of White Zombie is undoubtedly Lugosi’s eyebrows. 1940s – N/A I haven’t reviewed any films from the 1940s – this is very remiss of me and I hope to rectify it soon! 1950s – The Bat (1959) This is a quintessential 1950s murder mystery that takes place in a large mansion. The Bat has a bit of everything, a masked serial killer, a hidden fortune and a cast of suspicious characters. The film has a great cast including Vincent Price, who does an extremely good job as Doctor Malcolm Wells. The Bat keeps you guessing as to the identity of the killer until the very end and unlike several films from the same era gives the female characters backstories, brains and backbones. 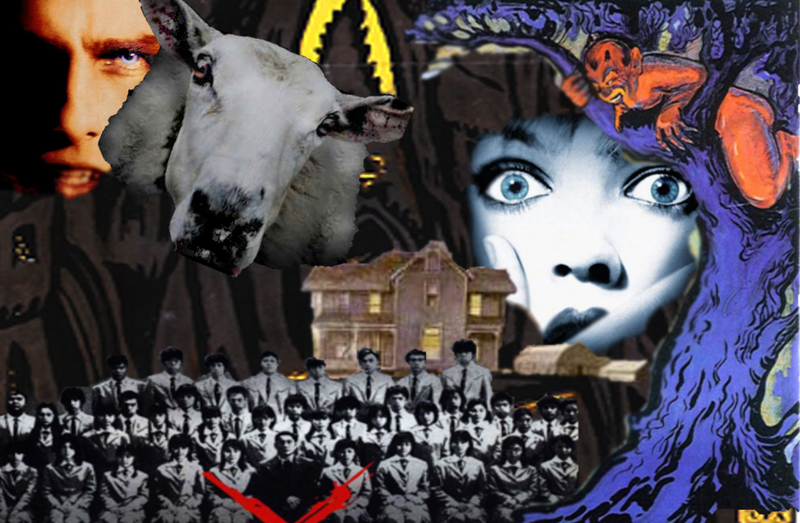 1960s – 13 Ghosts (1960) One half of a double review looking at the original 1960’s version of 13 Ghosts and the 2001 remake (which is barely recognisable as the based on the same film). It is directed by William Castle and contains one of his trademark publicity stunts, the use of Illusion-O glasses to view the ghosts. These work using either a red or blue filter to block or amplify the ghosts, an effect I replicated using old-style 3D glasses. 1970s – The Exorcist (1973) The 1970s was a decade with a lot of great horror films (and also a lot of awful ones) so it was a hard choice to pick just one. In the end I had to go with possibly the most famous horror film of them all, The Exorcist. It tells the story of Regan, an unfortunate twelve year old girl who gets possessed and the attempts of two priests to expel the demon. 1980s – An American Werewolf In London (1981) An American Werewolf in London is one of the best werewolf films made and one of the most well-known horror films from the eighties. An American tourist named David is comatose after being attacked by a werewolf. Upon waking in a London hospital, David is plagued by terrifying nightmares before undergoing an incredibly well realised transformation into a werewolf. The special effects in An American Werewolf in London are incredible especially for an era before CGI. 1990s – Interview with the Vampire (1994) Another tough choice between Interview with the Vampire and Scream but I had to go with my personal preference. Whilst Scream arguably reinvigorated the horror industry, the opulence and prevailing despair throughout Interview coupled with the fact it is my favourite novel won the day. Interview with the Vampire does exactly what the title says, it is an interview with the vampire Louis who tells the tale of his life as a vampire from 18th century New Orleans through to modern day San Francisco. 2000s – Martyrs (2008) Martyrs is one of the most brutal films I’ve watched and one of the most gripping. Two young women seek break into a family home and slaughter the family in a seemingly misguided revenge attempt. It soon becomes clear that there is much more to this than first seen and the pair become embroiled in an attempt to understand martyrdom and what lies beyond life. 2010s – The Babadook (2014) The latest decade seems to be full of remakes and sequels and The Babadook is the only film featured on Terror Tuesday from this decade that has received a rating of 5/5. It was a guest post by Jenny Mugridge and I haven’t actually seen the film myself but she thoroughly enjoyed it. Happy Halloween fellow horror lovers! Are you looking for a film to watch tonight to celebrate All Hallow’s eve? To help you decide, here is a rundown of the films that have scored 5/5 that I’ve reviewed so far. Scream (1996) – Wes Craven’s tongue-in -cheek masterpiece that revitalised the horror genre in the 1990s. Self-aware, Scream has an all-star cast headed up by Neve Campbell and Drew Barrymore. It features lashings of blood and a slightly inept psycho killer terrorising the local high school. Fun to watch any day of the week. Battle Royale (2000) – Set in a gritty alternate Japan where, in order to keep ‘The Youth’ under control every year a class is picked to be pitted against one another in a battle to the death. All the deaths in Battle Royale are imaginative and memorable which considering the large class size of over 40 students is no easy feat. Interview with the Vampire (1994) – An exquisitely rendered portrayal of Anne Rice’s opulent story of a trio of vampires. The film manages to capture the pervading sadness of the book whilst still being entertaining to watch. A big budget film it has the associated star-studded cast including Brad Pitt and Tom Cruise, however it comes together into a glorious romp through 19th Century New Orleans to 20th Century Paris and beyond to the present day. The Golem: How he Came into the World (1920) – This is a fine example of 1920s German Expressionism directed by Paul Wegener, who also portrays the Golem, a large man-like clay creature. In five chapters, it is set in the Jewish community in medieval Prague. It features all the hallmarks of Expressionism with unusually shaped and expressive set designs and the use of colour filters. I really enjoyed this film and anyone should watch it. Dead Kids aka Strange Behaviour (1981) – A short film that focusses on the local Chief of police as he tries to solve a rash of murders committed by different people, all of whom turn out to be under the control of the presumed dead Dr LeSange. The finale is surprisingly tense and the film is characterised by a lack of morality, making it stand out from the crowd. A great film for any evening, it has blood, intrigue and tension aplenty. Black Sheep (2006) – A kiwi comedy horror about killer sheep this film features great special effects from the team behind The Lord of the Rings and the demonic sheep are the undeniable stars of the film. Black Sheep strikes the right balance of gore, laughs and plot and is a satisfying romp around the New Zealand countryside.